This started coming into view last month when Carson Palmer — and then Drew Stanton — went down just as the defending champs began to heat up. The fight for the NFC West seemed like one of those races between baked goods or sausages on the JumboTron between quarters. It didn’t matter who was in first; we knew how it would end. Somewhere around the halfway point, it felt like the Seahawks had succumbed to their championship hangover. With reports of discord and distrust, an outcome that has befallen so many title teams looked like destiny for Seattle. Instead, the Seahawks have rounded back into their terrifying selves at just the right time. Ryan Lindley or not, Seattle dominated a Cardinals team that’s been incredibly tough at home the past two seasons. With Marshawn Lynch and Russell Wilson, the Seahawks have had the league’s most efficient running game all season. But watching Lynch beast his way off Patrick Peterson and into the end zone last night — and watching Seattle rack up 267 rushing yards against a great run defense — reminded us of the ground attack that turned defenses into dust on Seattle’s way to the Super Bowl. And Wilson wasn’t too bad, either. Arizona’s defensive downfall is covering tight ends, and the Seahawks knew it. Luke Willson needed just three catches for his 139 yards, and a couple of more big plays carried Seattle’s quarterback to easily his best game of the year. The defense did what it should have against Lindley, a below-average offensive line, and a harmless running game, but looked dominant doing so. Michael Bennett had another great outing in a season full of them. His $16 million guaranteed already looks like a crime, and there’s an argument that he’s been the Seahawks’ best defender this season. The usual suspects have their cases, too — the secondary gives the defense that “Do they really have 12 guys out there?” feel — but Bobby Wagner is the other name that warrants mentioning. It’s not as if the Seahawks were a bad defense for the five games Wagner missed, but they’re whole again with him back in the middle. Seattle has given up 6.6 points per game over their five-game winning streak, which happened to start upon Wagner’s return. A win over the Rams next week means the NFC playoffs go through Seattle and the contender boneyard that is CenturyLink Field. This is starting to become a holiday tradition: For the third year in a row, it’s Christmas, and the Seahawks are the scariest team in the NFC. Atlanta’s roster has its share of holes, but for most of this season, its toothless pass rush has been the biggest one. By almost any measure, the Falcons front four is kinder to quarterbacks than all but one or two others in the league. Before yesterday, Atlanta ranked 31st in pressure rate1 and last in sack rate. A sack-free approach is one of the many reasons the Falcons defense was hanging out at the bottom of the league through 15 weeks. Still, none of that stopped them from ruining Drew Brees’s afternoon and the Saints’ season. The Falcons got to Brees five times, hit him six more, and forced him to get rid of the ball quicker than he wanted to all day long. 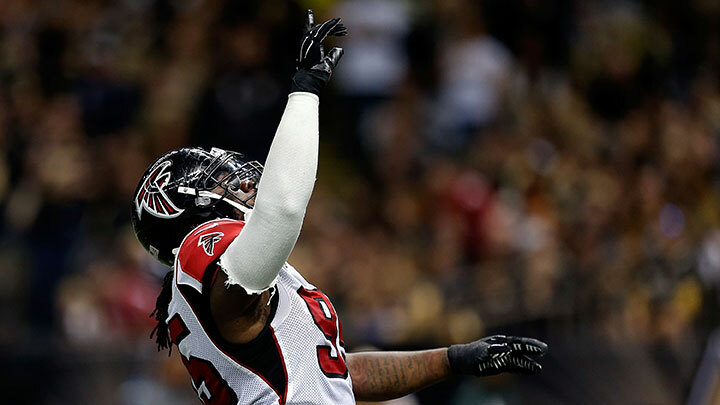 Atlanta’s five sacks are nearly 30 percent of what it had on the season. And the run defense wasn’t too bad, either. Mark Ingram managed just 2.9 yards on his 13 carries, and the longest run of the day for New Orleans came from Brees. For the second straight week, the Falcons held up against the run, an area that’s been almost as bad as their pass defense all season. With the way Atlanta’s defense played, Matt Ryan’s 322 yards and 75 percent completion rate were more than enough to put the Saints away. And more importantly, it was more than enough to put Atlanta’s future in its own hands next week against Carolina. A 7-9 division winner can only be so scary, but with a Week 17 Falcons win, either the Cardinals or Seahawks will be heading to Atlanta. Remember: The last time a division winner was a punch line, the punch line won. Just like the Falcons, both the Panthers and Chargers get to be masters of their future next week, thanks to two pretty tough dudes. Two weeks removed from a rollover car accident, Cam Newton was back on the field for Carolina, carrying the ball 12 times. Philip Rivers’s outing against the Niners was an up-and-down affair, but there were stretches of the second half when he was brilliant. And he did it all with a bulging disk in his back and a sore chest that cost him a couple of practices last week. Neither team probably poses much of a threat if it does sneak into the playoffs. The Chargers are a MASH unit, and the Panthers still lack the potency on offense to really scary anyone. But their deficiencies are what make even being in this position so impressive. The Panthers undoubtedly get a boost from the NFC South, but with everything the Carolina offense lost this offseason, even seven wins would be admirable. While Rivers’s weapons trump Newton’s, his offensive line has had its troubles. Both he and the Chargers offense have struggled at times, but I’m not sure any quarterback in the league is more responsible for his team’s win total (in a good way) than Rivers has been this year. Ross to reporters: "Here's a Christmas present. You don't have to ask me anymore. He has one year left on contract and is coming back"
I’m guessing Stephen Ross didn’t become Stephen Ross based on rash decisions. The guy has done all right, well enough to earn a cathedral of capitalism bearing his name in Ann Arbor. Still, it feels like announcing your head coach’s return after a gut-wrenching win that includes a game-deciding safety may not be the best time. Based on everything Philbin and Ross said after the game, the final two weeks of the season had no bearing on whether Philbin would be back, but a lot can happen in two weeks. We’ll never know what would have happened if the Vikings got off that final punt and eventually pulled out a win in overtime. But Philbin will be back, and he’ll again be in charge of a playoff-caliber roster that watched the playoffs from home. Keeping his job obviously leaves Philbin a winner, but his security should also provide some for Ryan Tannehill. If Ross had gone in a different direction with his coach, there’s at least a chance the new regime would have wanted to start over at quarterback. (See: everything that has happened in Washington.) By bringing back Philbin and his staff, Tannehill gets another year in Bill Lazor’s offense and another year to build on the undeniable progress he’s made. Well, that escalated quickly. Cowboys-Colts was supposed to be the game of the day; instead, Dallas blew Indianapolis off the field in what was one of the more staggering wins of the season. That said, the “Cowboys blowout” version of this game wasn’t impossible to imagine. It involved DeMarco Murray running all over a bad run defense, and the Cowboys secondary stumbling onto some of the magic it had earlier in the season against a team that struggles to run the ball. The Dallas defense came through on its half of that scenario. After a botched fake punt and two more three-and-outs, the game was all but over. Indianapolis came into the game with a top-10 pass defense,2 but it’s regularly roasted by tight ends. 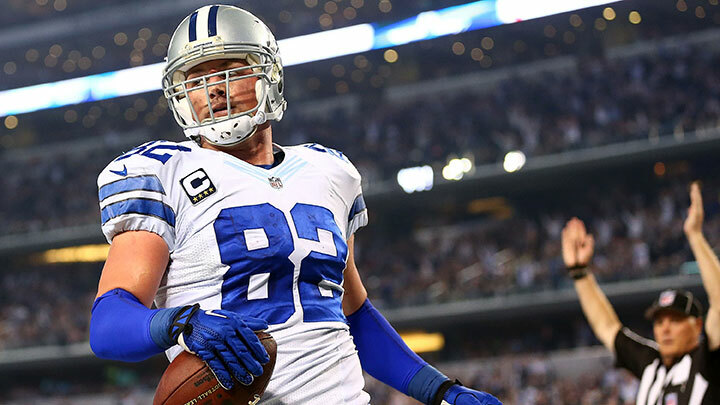 Jason Witten had a field day, Tony Romo was perfect, and that was that — run game not needed. The Cowboys aren’t immune from criticism here, though. Romo being in the game while up 35 and Murray — holding his left hand to his chest every time he ran off the field — getting 22 carries in a blowout is insane, but we can save that stuff for a weekend when Dallas doesn’t clinch a playoff spot. With their win and the Eagles’ loss, the Cowboys are your NFC East champions. Since their Thanksgiving debacle, the Dallas offense has left nothing behind but scorched earth. Come playoff time, the scariest teams are the ones doing at least one thing well — and right now, the Dallas offense is there. Even garbage time couldn’t salvage Joe Flacco’s day. His line of 21-of-50 for 195 yards and three picks is awful, but it’s not nearly as awful as the 4-for-22 mark he had at one point in the first half. 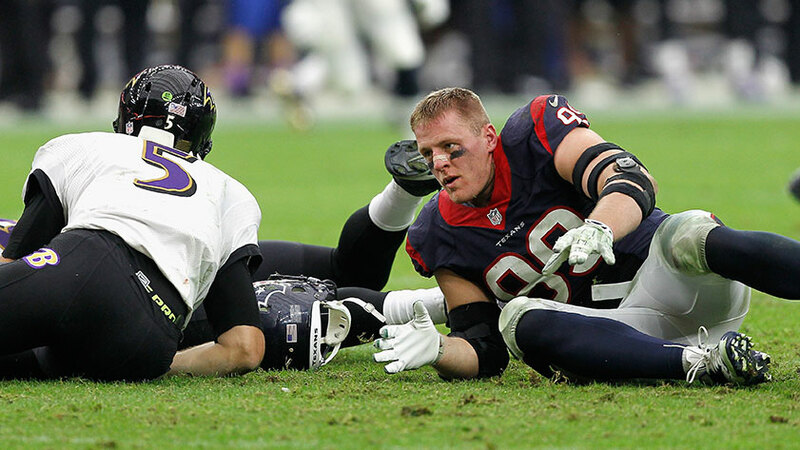 Houston hit Flacco 10 times, and from afar, it was easy to mistake Jared Crick for J.J. Watt. Houston sent extra rushers all game, and maybe it was the early pressure, or the great day from the Texans secondary, but Flacco was totally out of sorts and never really settled in. Even on days when Flacco and the passing game have struggled, Baltimore’s running game has been steady, but there was nothing there, either. Justin Forsett had another rough day, a victim of a three-TFL performance from Watt. The Ravens still have a good shot at the playoffs. If they knock off the reeling Browns, and the Chargers lose to Kansas City in Arrowhead — neither of which is hard to imagine — they’re in, but Baltimore’s worst offensive day of the year cost it a chance to determine how its year would end. By now, the Saints giving up 400 yards should be expected, but New Orleans scraping together just 14 points against the league’s worst defense in a must-have game is a different brand of disappointing. It’s even more depressing when you consider that one of the Saints’ two scoring drives was a 1-yard plunge from Mark Ingram after Jalen Saunders’s 99-yard kick return to start the game. The ugly truth about the Saints offense bubbled up again yesterday: Outside of Brees, who’s been quietly excellent this year, New Orleans just hasn’t gotten enough from its high-priced players. Jahri Evans earned his status as the highest-paid guard in the league, but he hasn’t played like it this year. Marques Colston is no longer a no. 1 receiver, but his price tag says he is. And even on his tight-end discount, injuries have limited Jimmy Graham’s impact all season. When Brees gets thrown off — as he was yesterday, in part because of replacement left tackle Bryce Harris’s nightmarish day — the Saints offense can break down. As Bill Barnwell touched on last week, the Saints went all in this season, hoping to surround Brees with a title contender as he hits the twilight of his career. They came up empty, and based on the sacrifices made to put this group together, that hurts a lot more than it would for other teams. It’s hard to imagine a crueler end for the Eagles than DeSean Jackson ruining their season. But as Malcolm Jenkins aptly put it postgame, the late-season collapse really comes down to Philadelphia’s minus-eight turnover margin: “We were on borrowed time playing that style of football. If we had run the table in December with that kind of football, it would have been surprising, and it’s something we didn’t fix.” Two turnovers from Mark Sanchez, a mind-numbing number of penalties, and Jackson having his way with Bradley Fletcher were all enough to send the Eagles home. Philly’s success this season came in a way most wouldn’t have expected. They rode a stout defense — specifically, a monstrous front four — and the league’s best special teams, while a banged-up offensive line and inconsistent quarterback held back what many thought would be a potent offense. They now have some choices to make this offseason. Jeremy Maclin, coming off a career year, is set to be a free agent, and it may be time to extend Fletcher Cox, who has turned into one of the league’s best defensive players. But the real decision will be at quarterback. There were plenty of easy throws available in Year 2 of the Chip Kelly offense, and there were plenty of easy throws missed. The Eagles are young on defense, and their offensive line is locked up for the foreseeable future. 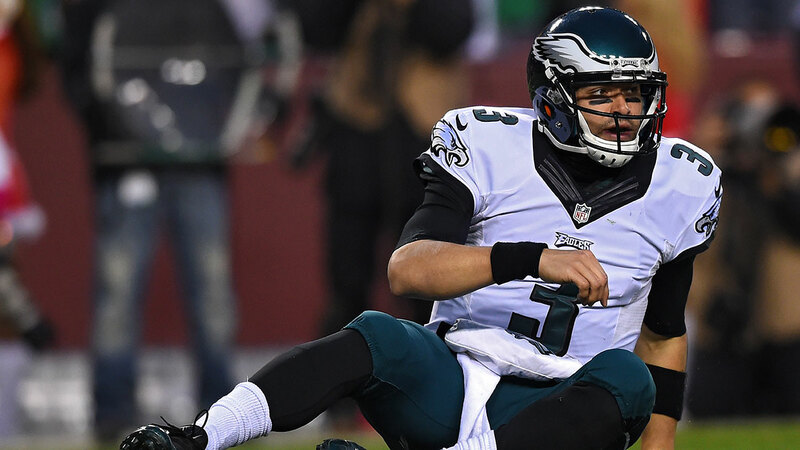 It’s easy to see this team being competitive for a long time, and while Kelly can occasionally mask the deficiencies of his quarterback, the Eagles are really no different than any other team. It all depends on who’s under center. The percentage of opponent dropbacks with pressure. The Colts are second in DVOA against no. 1 receivers. Credit Vontae Davis with … all of that.